Media opportunity: Launch of the Forward North Staffords Exhibition, 12 noon,Friday, July 1, the Staffordshire Regiment Museum, DMS Whittington, Lichfield, WS14 9PY. Tom Wedgwood and Inspired Film and Video on location. A new exhibition is to be launched paying tribute to Major Cecil Wedgwood, a war hero and Chairman of the world renowned Wedgwood company, who led volunteer soldiers from the firm into one of the bloodiest battles in history. The Forward North Staffords exhibition – funded with the support of a £10,000 Heritage Lottery Fund grant – opens at the Staffordshire Regiment Museum, DMS Whittington, Lichfield, on Friday, July 1, the 100th anniversary of the beginning of the Battle of the Somme. As Britain remembers the estimated one million men who were killed and wounded in the largest battle of WW1, people in Staffordshire can pay tribute to Major Wedgwood and his 168 troops. “Forward North Staffords” are said to be the final words of encouragement from Major Wedgwood as he led his men to war. He lost his life on July 3, just three days into the battle. The special exhibition, a partnership between the Staffordshire Regiment Museum, the Wedgwood Museum and Inspired Film and Video. The Stoke-on-Trent film company has been commissioned to make a documentary on Major Wedgwood and the volunteer soldiers from the Wedgwood china factory. It will be at DMS Whittington between July 1 and July 3 and will then move to the Wedgwood Museum on August 8. The exhibition will return to the Staffordshire Regiment Museum at the beginning of September and will remain on display until the end of the Battle of the Somme commemorations. Danielle Crozier, Curator at the Staffordshire Regiment Museum, said: “100 years ago thousands of brave men gave their lives on the battlefields of the Somme. As part of our commemorations we will be remembering Major Wedgwood and his men at the museum. Cecil Wedgwood was a towering figure in North Staffordshire history and is celebrated as a war hero, chairman of the iconic Wedgwood brand and the first Lord Mayor of Stoke-on-Trent. Having previously seen service in the Boer War, and been decorated as a war hero, Major Wedgwood volunteered to raise his own battalion of the North Staffordshire Regiment and shunned the chance of a strategic role to personally lead his men in the trenches of WW1. He was 53-years-old. Surviving members of the regiment paid tribute by writing “One of England’s Best” on a wooden cross at his grave in the Baupaume Post Military Cemetery at La Boiselle. Tom Wedgwood, an eighth generation descendant of Josiah Wedgwood and the Great Great Nephew of Cecil, said: “I’m delighted to have the opportunity to be involved with this project and present this film about Cecil Wedgwood and the men from the Wedgwood Factory who fought in the Great War. “These great stories of social conscience helped to make Wedgwood the company that it is today. The sacrifice made by these men and the impact that they had, not only on the factory but also on the community, is critical to our understanding of the bloodiest conflict of the 20th century. 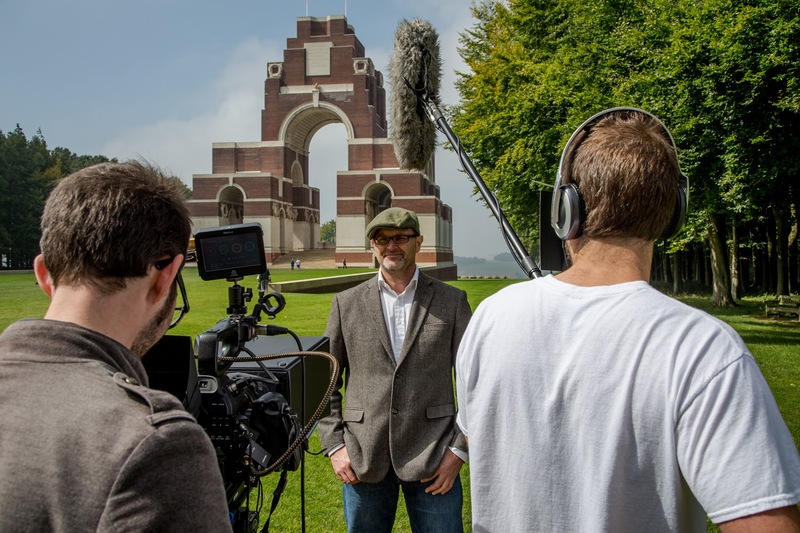 Tom Wedgwood is the narrator of the Forward North Staffords documentary.